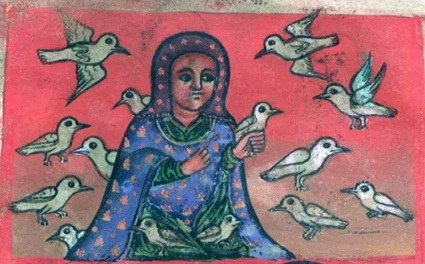 A poem praising the famous Ethiopian Christian saint from head to toe, using the saint’s body parts to create an allegory of the saint’s virtues and life. and their tips, your nails, their color is snow and hail. Walatta Petros, oh, you topaz and emerald stone. Excerpted from The Life and Struggles of Our Mother Walatta Petros: A Seventeenth-Century African Biography of an Ethiopian Woman, Princeton University Press, 2015. Republished here by courtesy of the publisher, with special thanks to Wendy Belcher.